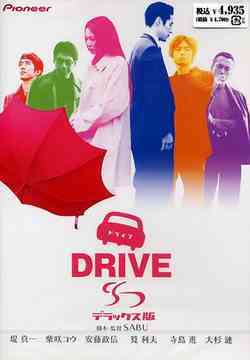 In Drive, Tsutsumi is a salaryman, Asakura, who is carjacked and kidnapped by three bank robbers and ordered to pursue a fourth man, who has escaped with the loot and the getaway car. Trouble is, Asakura has spent his whole life playing by the rules, and that includes following the speed limit and all traffic signs, and even mastering that increasingly lost art that the old-timers once called a turn signal. So the man with the money gets away, but becomes trapped by literally a hole in the ground. The other three criminals are at first angered at Asakura, but later come to like him. As they drive through Tokyo, experiencing the spectrum of its society, they become less and less interested in the missing money and more about how they can fulfill their happiness without it.